The structure of Hidden but Now Revealed is straightforward. In chapters 1-10 the authors trace occurrences of mystery (μυστήριον) throughout Daniel and its Greek translations, a sampling of early Jewish texts, Matthew, Romans, 1 Corinthians, Ephesians, Colossians, 2 Thessalonians, 1 Timothy and Revelation. In chapter 11, the authors consider texts that lack the word mystery but contain similar concepts. Chapter 12 then examines the relationship between Biblical mystery and ancient pagan mystery religions; how much does the Biblical concept rely on its contemporary context? Starting with Daniel is an obvious and fruitful choice. The first appearances of mystery are likely foundational to appearances elsewhere. The authors emphasize two points from Daniel. First, a revelation of mystery is not necessarily an ex nihilo disclosure; rather, it is something partially, but not entirely, hidden in the past. For example, Nebuchadnezzar remembered the symbols from his dream and even appeared to have very basic ideas of its meaning. So there is some continuity; not absolute hiddenness. Second, mystery is “a revelation concerning end-time events” (p30), specifically the establishment of the kingdom of God. This is confirmed in the Jewish literature also. With this narrowing in place, proper understanding of mystery in the NT is brought into focus. Turning to Matthew, it is argued that Jesus is in line with Daniel’s understanding of mystery. Just as in Daniel, mystery (Matt 13:11) “plays a pivotal role in Jesus’ teaching on the end-time kingdom” (p57). It is common to debate how Jesus’ vision of the kingdom of God relates to the Old Testament, but as the authors argue, Jesus saw his own teaching as a revelation of mystery, so He is revealing new yet hidden information. According to Jesus, the kingdom has begun in a hidden way and the righteous and unrighteous will coexist for a period before His return and the final judgment. That is to say, His kingdom is already and not-yet. In these ways, Jesus’ teaching “contrast[s] with the Old Testament and Jewish expectation of the kingdom” (p69), but does not contradict them. The excursus on Matthew unpacks these expectations of God’s kingdom in the OT and Early Judaism, concluding that “the defeat of God’s enemies and the establishment of God’s kingdom were to occur decisively and completely at all at once at the very end of world history” (p83). This raises the questions of exactly how Jesus’ teaching wasn’t entirely novel, and how His revelation sheds new light on the OT. For example, I can understand Jesus “zoomed in” on Daniel’s four successive kingdoms vision and revealed that the transition between the fourth and the Kingdom of God is not clean cut; that God’s kingdom has already begun breaking in. This is surprising after reading Daniel, but it is not contradictory. However, how should I now re-read specifics in light of Jesus’ revelation? For example, the little horn in Daniel 7 persecutes the saints before the establishment of God’s kingdom. If Jesus is saying that His kingdom has begun to break in in His first coming, does that mean the horn has come and gone (perhaps in AD70 events)? Or if the horn remains future, how does that fit with Daniel’s timing? In other words, Jesus’ unveiling leaves one confused about specifics in Daniel’s vision that don’t seem to fit. Admittedly, addressing these implications could fill its own book, but a few suggestions from Beale and Gladd would have been welcome. Of course, this is a question for Jesus, not just the authors! This is essentially my most significant criticism: in numerous places questions of this sort were left unaddressed. There are certainly exceptions, such in the Romans excursus where the authors argue that re-reading the OT shows hints that Gentiles would in fact be saved before the Jews (e.g. Deut 32). So the mystery unpacks something there in the OT but still veiled. However, admittedly, the OT mostly teaches the opposite (e.g. Isa 49:5-6). But to their credit, the authors offered an explanation in this case: “those Jews first hearing and accepting the gospel at Pentecost and shortly thereafter in Jerusalem” (p88) as reflected in Acts are the beginning fulfillment of the “Jew first” concept. This criticism aside, not everyone will agree with the individual conclusions reached. Traditional dispensationalists will probably find the most to be frustrated with, since the authors present different views of Romans 11 and Ephesians 2. Also, the identity of the man of lawlessness in 2 Thessalonians 2 relies on a particular (though common) interpretation of Daniel 11 that is assumed and not defended. As one expects from Beale, this book is chock full of both intricate and overarching insights and repays close study. Gladd’s dissertation was on mystery, so his contributions are no doubt significant. Although mystery may seem like a small topic, its implications are far-reaching and it seems like every mystery text is controversial and difficult. It takes skill to thread through such difficult issues, but the authors appear to do it with ease. The book certainly succeeds in its goals of examining the mystery texts in detail and presenting an overarching theme that ties them together and I found it mostly convincing. I found Hidden but Now Revealed to be profoundly beneficial to my own study. There was certainly a lot of meat to chew on! The material on Ephesians was particularly rewarding, but the entire work is rich with detail and depth. Beale and Gladd manage to present a holistic and compelling understanding of mystery and, even if one disagrees with some of the details or convictions of the authors, it would be unwise to ignore this work. 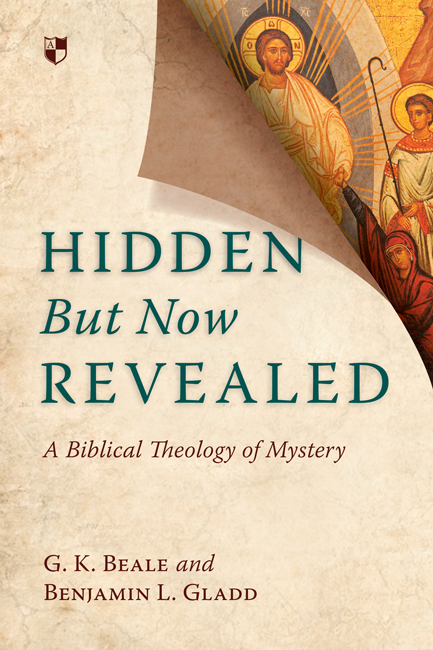 Hidden but Now Revealed certainly proves that mystery deserves an entire book after all! Many thanks to IVP UK for providing a copy of this book in exchange for a review. Their generosity has not affected my review.